website that appear on this webpage. His solar work in Haiti and in places such as Nicaragua, Rwanda, Mali, Peru, Pakistan, Mexico, Chile, Mali, and India, is certainly a source of pride to the state of Maine. 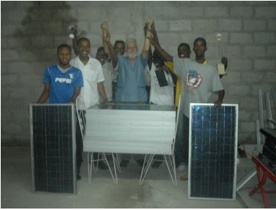 Dr. Richard Komp of Harrington, Maine, has been working with two Haitian groups for some years now, helping them start their cottage photovoltaic (PV) module manufacturing workshops, as well as teaching them about solar cookers and solar microdrip irrigation. 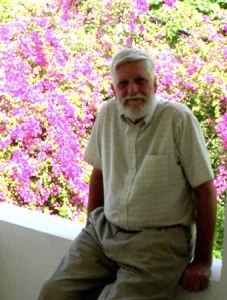 The first Haitian group with which Dr. Komp is involved is Movement Pizance de Paypay (MPP), which is a large (50,000 member) self-help cooperative based in Paypay near Hinch in the central highlands. Chevannes Baptiste, the head of the movement told Dr. Komp by e-mail that after the earthquake, they are feeding and housing thousands of people who have received no help at all from the outside NGOs, and that they are running out of money and food but carrying on. This is the group that Dr. Komp did a lot of the solar microdrip irrigation work with; installing a large system to irrigate hectares of land. The work of Dr. Richard Komp can be viewed at the MESEA www.mainesolar.org website and visitors to this website can read about his work in Haiti (and other 3rd World places) at the International Work page. Since my first trip to Haiti in November of 2003, the Grupo Fenix from Nicaragua has been back two other times; but this was my first trip back to work with the two groups who are running cottage photovoltaic (PV) module assembly plants. This fourth Fenix trip came about rather suddenly as a result of the groups switching to the new Evergreen Solar ribbon growth PV cells. These cells are made a new way which uses far less of the expensive pure silicon than the Astropower PV cells they had been using, and are less expensive, even though they are just about as efficient; but they are very fragile and harder to handle. One of the groups, organized by Jean Ronel Noel and Alex Georges, also had a problem with Fed-Ex badly damaging the box of 2000 Evergreen Solar cells I sent them. This group, which has started a new tiny company called Enersa SA, also had several customers on a waiting list that had already put down their deposits. The other group, Movement Pasiance de Paypay (MPP or the Paypay Peasants Movement) had also been wanting to switch to the new ribbon grown cells; so the groups got together and asked me to come and help them out. I was in Haiti for two weeks in the joint trip, spending a week at each location. First, I worked with Enersa in their shop in a semi deserted warehouse district near the Citi de Solei in Port au Prince. 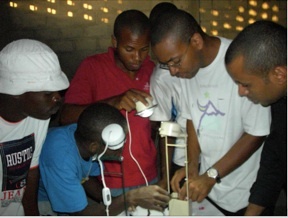 The group of workers, mostly young people from the notorious Citi de Solei ghetto, quickly got the technique of sorting and cutting the damaged PV cells from the Fed-Ex boxes, and we managed to salvage far more of them than Jean Noel Ronel and Alex Georges, the managers of Enersa though was possible. The intact cells (even with small cracks) were saved to make 60 watt PV modules. We cut as many of the broken PV cells as possible exactly in half, to make 30 watt modules. The smaller pieces were saved for 15 watt and smaller modules. 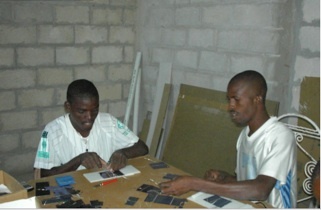 Enersa workers sorting and cutting the broken PV cells. I then taught them the new way of encapsulating the PV cells developed by Marco Antonio, the landmine victim who runs the Grupo Fenix cottage PV factory in northern Nicaragua. Marco and I are now coauthors, with Susan Kinne and others of a scientific paper we gave at a major international photovoltaics conference in Dresden, Germany last September. 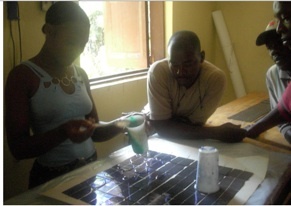 Since that time, I have been showing the other cottage PV factories the new technique (see Solar Work on the Miskito Coast) and the more recent developments worked out by these cottage industry groups. The Enersa group picked up the basic technique very quickly and even added their own improvements, which I will now pass on to the others. Jean Ronel and Alex are both very creative and willing to try new ideas: The day I arrived, they showed me a new self-contained solar LED light. 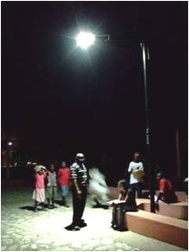 This light, which uses less than 1 ½ watts is bright enough to light up a whole table and has its storage battery built into its base with a plug for the input from the attached 6 watt PV module and another with adaptors to recharge different models of cell phones (which have become very popular in Haiti ). The lamp puts out enough light to light up the tiny home of a poor Haitian, but the entire package will sell for only $70. The PV module for the lamp is made from the smaller broken pieces of the Evergreen Solar cells damaged by Fed-Ex. were interested in setting up a microloan program in Haiti to create small solar cell phone charging stations in the poorest neighborhoods. While we were eating dinner at the fancy Olefson Hotel, the electric power in Port au Prince quit (a very common occurrence there) and we used the lamp to light up the entire table to continue our meal and discussion (even before the waiters brought candles). afternoon we got to see Hugo Chavez’s motorcade when he came on his state visit from Venezuela. There was a large, enthusiastic crowd lining the street for his arrival. 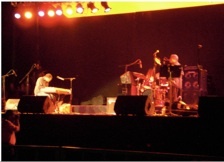 Another evening we went to a Jazz festival; great music with a real Caribbean flavor. I think I was the only “Mr. blanc” there but felt very welcome. showing the group how to manufacture PV modules and then using them to power solar microdrip irrigation installations. meant we had to keep the bouncing to a minimum. to efficiently use the broken PV cells. people who were waiting for their PV system. They will also expand the PV array on the cyber café. I stayed right on the MPP complex in their guesthouse and ate dinners with the rest of the group. The food was the very good traditional Haitian cuisine, which is very similar to the food in Mali, West Africa. We always had a base of some grain, usually sorghum, with a gumbo made with okra and either chicken or goat meat. MPP is working with the local peasants to improve their diet so we always had a salad and often had cooked greens to get the proper vitamins in each meal. I drank the local water, which is piped from a nearby spring and safe; but in Port au Prince, I had to drink the locally prepared bottled water sold to all those who can afford it, since the water there is badly contaminated. The hospitality I felt in Haiti was very genuine and gratifying; I was treated like a family member and got to go everywhere without feeling out of place. However, Haiti is still a very lawless country. While I was at MPP, I heard the story of how their solar powered microdrip irrigation systems were robbed by gangs with guns. On the second Grupo Fenix trip to Haiti, Carolina Barreto had installed a large PV powered water pump to fill a storage tank from a well to irrigate several acres of farm gardens. The group had actually cemented the 1.2 KW PV array right into the roof of the storage tank, but the men with guns chipped away the mortar and took the modules. They did the same thing to a second system installed afterwards and I was told that they took the modules to the Dominican Republic to sell. However, a number of the modules couldn’t be removed easily so they deliberately broke them. I went through the pile of broken modules and found that most of them still worked, but not all at full power. (Bullet holes do mess up a PV modules somewhat). I showed them how to rescue what they could and these are now being used on MPP’s own buildings to charge storage batteries. The UN has a very visible presence and I am told that things are slowly changing. For instance, an international aid program is rebuilding the road from Port au Prince to Hinch so that the 6 hour SUV trip will again become a 1 ½ hour drive in a regular car. I rode back to Port au Prince the morning of the day before my plane was to leave, so that I got to spend that afternoon visiting with the Enersa group and view the progress they had made. In the time I was away, they had put together twelve 60 watt PV modules and were assembling two more when I arrived. 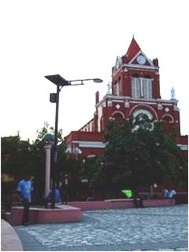 They had also made two 30 watt modules and several small solar cell phone chargers for the NGO project. They have developed a new variation of the encapsulation procedure, where they put a measured 400 ml of the liquid silicone on the middle of the array of PV cells and then, after laying on the glass cover, slowly add weight to force the silicone into all the cracks and behind the cells squeezing the air in front of the moving edge of the silicone. They use far more pressure than I had imagined was possible, but the uniform pressure doesn’t crack any of the fragile PV cells On the Miskito Coast, we used derelict car batteries in a similar way. 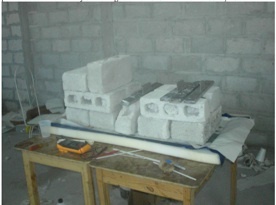 developing and manufacturing the small PV modules and the self-contained solar LED lanterns for the peasants. to Haiti in his luggage. 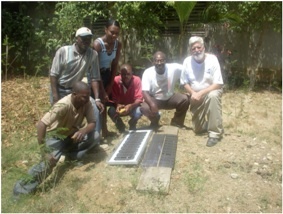 Photovoltaics is alive and doing well in Haiti. Laminating a 60 watt PV module, this pile of blocks and lead weights replaces the expensive laminating machine normally used in commercial PV module production.